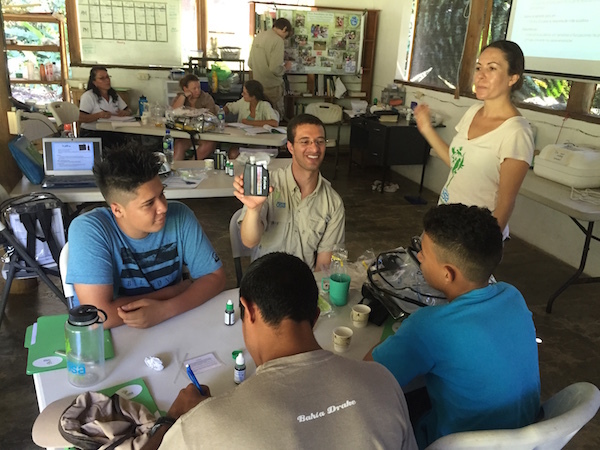 My name is Erin Engbeck, I have been volunteering at Osa Conservation for 4 ½ months as a Research Field Assistant for the Ríos Saludables de Osa program. 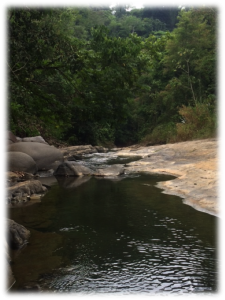 During my time here, I have collected baseline data throughout the Osa Peninsula and had the wonderful opportunity to work directly with community members through workshops and community events. Our workshops are aimed at educating the community and getting their involvement for future monitoring efforts. 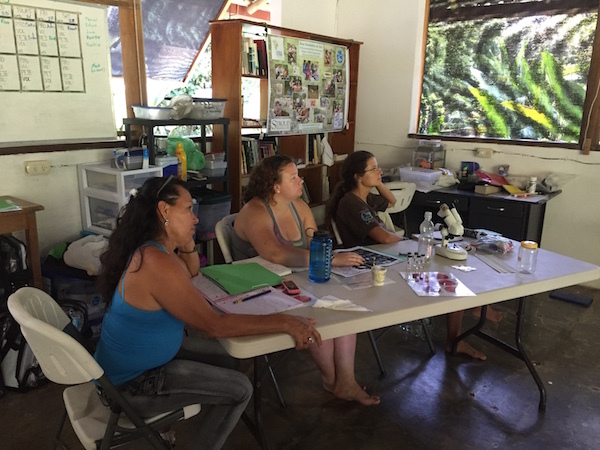 In February, we took Ríos Saludables on the road to San Josecito, a small community near Uvita, Costa Rica. The community was very receptive and happy to join in on our workshop because they have had concerns that some individuals have been poisoning their streams in order to collect river shrimp, this in turn will affect their own drinking water and health. During our first stay, we engaged the community in techniques and methods for water sampling and in the end left them a backpack of supplies so they could continue the monitoring independently. On March 28th, Ríos Saludables returned to San Josecito with the help of Alejandro Muñoz and Ronny Araya from the University of Costa Rica for a follow-up workshop, in which we were able to check-in on community members and see how their testing was coming along. This time around was just as engaging as the first, all the citizens were extremely interested in testing their water quality, especially since some individuals were recently seen shrimp “fishing” in one of the streams. Our day started around noon on the Morete River going over all the different methods of testing for the river. 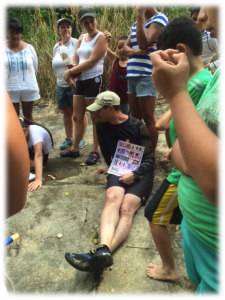 The community members led the way as we went through the steps for visual, chemical, bacterial, and macrobiological surveys. For the first half of the workshop we broke-up into groups of two and collected data for chemical and bacterial testing. This included testing for nitrates/nitrites, dissolved oxygen, turbidity, alkalinity, pH, temperature, conductivity, and E.coli. After chemical and bacterial sampling, we moved on to macroinvertebrates. This by far, is everyone’s favorite activity. I mean what could be more fun than to play in the water while sampling for aquatic insects? 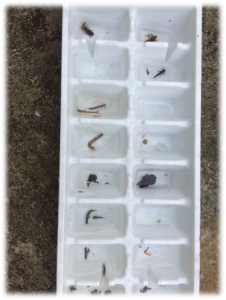 Macroinvertebrates are not only fun to sample but are important indicators for water quality, this is because only some can survive in certain water temperatures and chemistries and are very sensitive to changes in these. 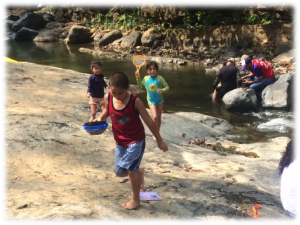 The San Josecito community was very happy to find that they have great water quality based on the Biological Monitoring Working Party Costa Rica Index (BMWP-CR). This index assigns scores for the different macroinvertebrates families and allows the user to tally said scores and categorize the stream based on the total presence of the different families. In the future Ríos Saludables plans to revisit San Josecito to check-in on their monitoring progress and to work more directly with the schools in hopes of engaging and educating the next generation. In a new activity carried out under the Osa Healthy Rivers framework, six representatives of communities located throughout the length of the Peninsula got together at Piro Research Station to learn about monitoring the physicochemical and biological conditions of the rivers. This workshop, which took place from Friday, February 27 to Saturday, February 28, had the participation of representatives from ASADA (Administrative Associations for Aqueducts and Sewers) and the La Palma school, ASADA representatives from Sándalo, and officials from the sea turtle monitoring program LAST (Latin American Sea Turtles), who are based in Playa Blanca and form part of the network of turtle protection promoted by the organization WIDECAST. The workshop was facilitated by the Osa Healthy Rivers team: Pilar Bernal (Environmental Education Program Coordinator), Erin Engbeck (Aquatic Field Research Assistant), and Jim Palmer (Science and Education Program Director), accompanied by Alejandro Muñoz, a Costa Rican biologist with experience with biomonitoring studies. During the first day of the workshop, participants received theoretical and practical training on the analysis of physicochemical characteristics of water and measuring the microbiological contamination through coliform bacteria. The workshop participants had the opportunity to put this knowledge in practice by analyzing the quality of the water in Piro River, which crosses the station. 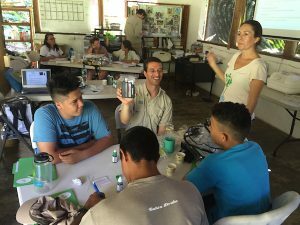 During the afternoon, Juan Carlos Cruz, Feline Program Coordinator, shared his experiences monitoring mammals at the station, through the use of camera traps. The second day of the workshop was dedicated to biological monitoring of the water quality of the rivers. 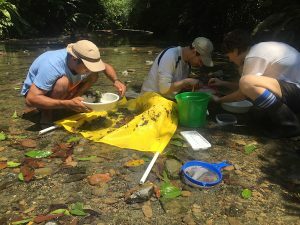 After an informational session in the laboratory, participants were directed again to Piro River to use kick nets, D nets, sieves, and other implements used by limnologists, the scientists who study of bodies of fresh water, to capture the organisms that live in the rivers. 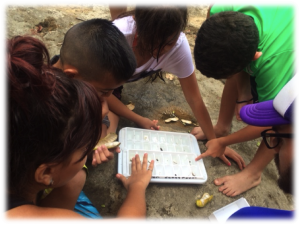 After working collaboratively, over 25 different types of aquatic invertebrates were observed, including various types of crayfish, prawns, dragonflies, stoneflies, caddisflies, and mayflies. 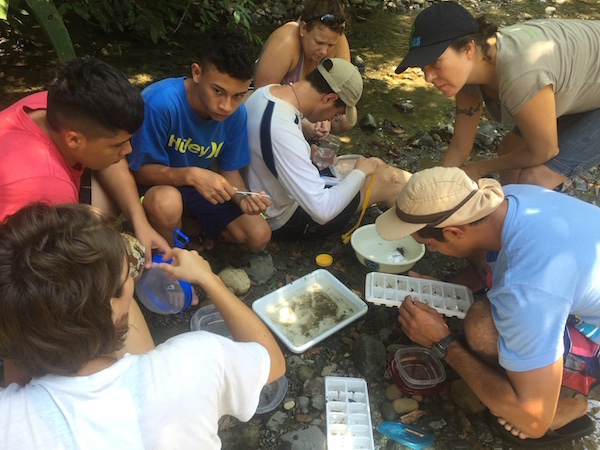 The diversity represented by these organisms allowed participants to conclude that Piro River’s water quality is “excellent,” by using the biotic index BMWP-CR, which is a metric used to measure the water quality in Costa Rican rivers based on the presence or absence of different types of aquatic macroinvertebrates. The most important lessons of the activity, however, arose from the reflections generated by the interaction between the workshop participants. The representatives of the different ASADAs had the opportunity to compare their experiences, and explained to the other participantes the great challenges that communities face managing their water sources and assuring an adequate and constant supply of drinking water to their end users. Together we learned how the management of water resources depends on many people and entities working together: the local aqueduct administrators; the end users who receive the water, who are generally found spread across many different towns; the institutions that accompany and supervise the ASADAs like the Institute of Aqueducts and Sewers (AyA) and the municipalities. The workshop participants concluded that it’s important that neighboring ASADAs communicate and share experiences in order to work as a team and support each other. The Osa Healthy Rivers program in its first stage has been developed through interaction with schools and their respective teachers, and this workshop has shown us that it’s important to coordinate monitoring efforts as well with the ASADAs, in order to promote more integrated monitoring and management of Osa’s rivers. In addition, this will allow communication and exchange of experiences between the teams that manage water in the different communities throughout the Peninsula. My name is Sofia, I am originally from Sweden, I have a Master’s degree in conservation biology and I have been on Osa Peninsula working as a Research Field Assistant for Osa Conservation for two months. I work for the Sea Turtle program, collecting data and working with turtle conservation based on nesting activity on the two beaches Piro and Pejeperro. Sea turtles are endangered species. 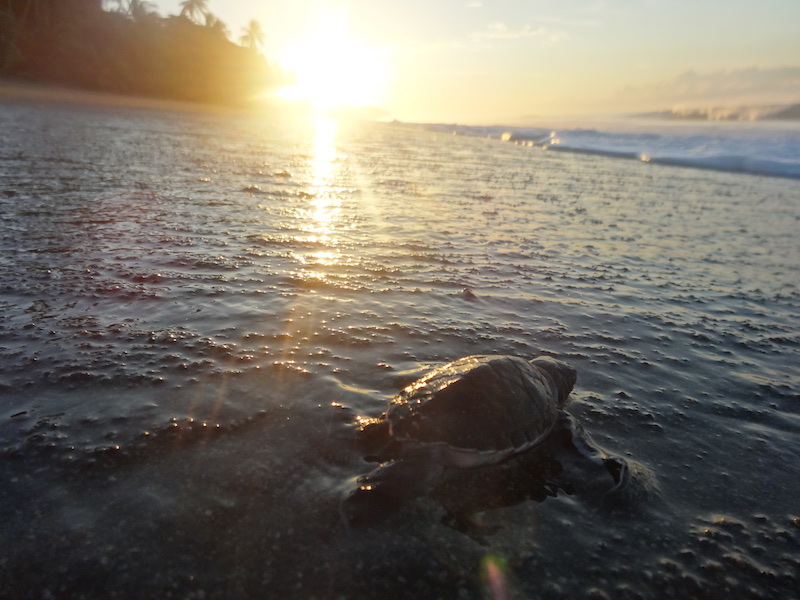 Some of the biggest problems are habitat destruction, climate change and human threats, both in water and on beaches where the turtles lay their eggs. It is well known that conservation efforts concerning sea turtles need to be focused on the life stage where efforts make the biggest impact on turtle population growth. The general idea is that conservation efforts focused on adult and large juvenile survival is more important for population size and growth than a focus on the eggs and hatchlings. This theory suggests that putting effort and money on reducing mortality in late life stages, such as altering fishing practices, would be the key to population recovery. Sometimes I ask myself: Why do I do this? Why do I travel across the world, expose myself to venomous snakes like the infamous beast Terciopelo and unpleasant bugs biting me until it’s hard to find a spot anywhere that is not itching or big waves playing a bit too rough? After 5 years of university studies I still choose to work for only food and housing in a place so far away from everything familiar, and I work with sea turtles at a life stage that does not have a big impact on the population size of the species I am fighting to save. While the rest of the world has its own interests. It might be building a big hotel close to the beach with lights that confuse the turtle hatchlings on their way to the ocean, it might be the fishing industry wanting to harvest as much as possible before anybody else does even if they end up with a big by-catch of sea turtles, it might be a broke old Costa Rican man trying to find food, sea turtle eggs, for the day. The truth is there are a few reasons for me being here. I like traveling and the best way to experience a new environment is to live in it. Maybe I will always keep searching for a place where I fit in. Saving baby turtles is good for raising awareness and it is good publicity for the issue as for conservation in general, baby turtles are easy to like. Even if the survival rate for them is very low I believe it is important not to forget about this early life stage and the beach habitat. But the most important reason for me to walk up and down these neotropical beaches every day is that I live for what I do and for what I believe in. I can’t just sit and watch the other interests destroying these beautiful beaches with dark sand and coconut palms everywhere, destroying that playful blue ocean by exchanging the fish with plastic or driving another species to extinction. There is a difference between science and theories and actually doing something about the things you believe in. Sometimes, to keep the strength to fight, I need to feel like I’m doing something real. I believe that as long as there are people willing to fight we can still win and many more people after me can come here to visit these beaches and experience the excitement of finding the tracks of a mom-turtle to the nest where she laid her eggs or even be lucky enough to witness the hatchlings first strokes in the water. But to whoever comes here next: lower your standards, don’t stay at the big hotels at the beach. Take a walk on the trails in the rainforest and truly experience it instead. Smell all the smells, listen to the sounds of the Macaws and watch the lizards run away from you. And don’t do it for the pictures you want to show your friends, do it for yourself and for the ecosystem we are all a part of.